One of my recent discoveries has been the Mormon art world, formerly a dark continent for me. With the passing of the late Mormon president, I thought I might offer a window into an aesthetic realm that, I suspect, is still largely unknown to many. Most non-LDS people will have heard of the Mormon Tabernacle Choir. Some may be aware of the imaginative Book of Mormon illustrations by Arnold Friberg. And anyone who’s been on the internet long enough will recognize the utterly bonkers right-wing propaganda produced by Jon McNaughton. However, few know the very impressive offerings by contemporary Mormon artists. Apparently, BYU has an excellent Fine Arts department. The jewel in their crown is Wulf Barsch, a Bavarian émigré who studied under the Bauhaus Masters, themselves trained by Klee and Kandinsky. After some flirtations with the Viennese school of Fantastic Realism, best represented by Ernst Fuchs, Barsch, we read, “studied Egyptian and Islamic culture and history.” These influences would come to the fore in his later work. He was baptized a Mormon in 1966, went to BYU to study Fine Art, and stayed there for some forty years. Barsch’s work is marked by a few cardinal motifs. He always uses vivid colors, often structured by two juxtaposed elements: a blurred realism and a lightly sketched geometric design. This combination gives his work the slightly dizzy air of a dream – or, better yet, of a mystic vision, of some terrible sacral truth unveiling itself. The viewer becomes the prophet. Barsch’s study of Islamic art and its long tradition of sacred geometry has borne much fruit throughout his career. Barsch’s prophetic accents are heightened and canalized by a keen ritual sensibility. On those occasions when he does depict architectural details, they usually reflect the norms of temples: Classical, Masonic, and Mormon. 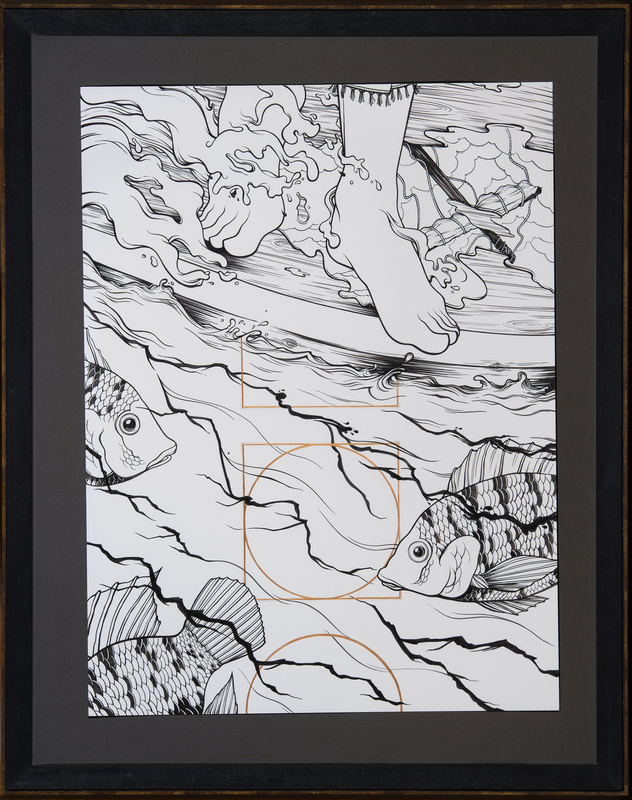 He will sometimes write on the painting, adding a secondary symbolic layer to the image. Title Unknown, Wulf Barsch. (Source). Observe, if you will, the piece above. Looking at this painting, we are struck by the contrast between the garlanded, barely visible columns and the stark yellow and red scene beyond. The most immediate impression comes from the color, which forms, as it were, the raw material of the art-world we see. Yet we can also glimpse geometric drawings in the yellow field and the outline of the columns. That which is artificial melts away before the manifestation of the absolute. Lesser being fades, even as it is heightened beyond its limitations under the demands of human artifice. Yet even in contemplating the absolute, we recognize something like our own reason. There is an intelligence there, an ideal that is only dimly mirrored in this dark world below. In short, Barsch has presented a model of mystical experience. Or take another painting. Below, we see is, at first glance, little more than a tropical landscape. We can feel the heat through the stereoscopically blurred palm fronds. Yet upon further consideration, we find a celestial scene in the blue window – an impossibly delicate set of constellations in a field of bright bleu celeste. There is at once a sense of familiarity and otherness. Are we inside or out? We experience a de-familiarization of the scene. This sensation comes, appropriately enough, through the viewer’s discovery of heaven in the painting. Likewise, the soul feels a similar sudden reversal upon the discovery that there is a God. The subtle intrusion of the transcendent changes the way we look around us. Barsch is intensely interested in the way the numinous appears through creation. His vision is almost sacramental, with one important caveat. The presence of the transcendent that he describes is not resting in the material realm but in its ideal configuration. He represents this ideal world, as well as our access to it, by use of the Labyrinth, a frequent symbol. The same idea animates his Magic Square (2006). The titular magic square appears in the silhouetted palm tree, as if exposing its underlying mathematical nature. It’s as if Barsch is showing us God’s blueprints. Barsch has won multiple awards, including the prestigious Rome Award, over his long and prolific career. He has also carried his talents across media. For example, here is one of his lithographs. Barsch continues to exert a major influence on the oeuvre of younger Mormon artists. Whitney Johnson, David Habben, and Nick Stephens all exhibit signs of Barsch’s lingering artistic vision. A very different representative of contemporary Mormon artistic trends is Brian Kershisnik. An American who originally trained in ceramics at BYU, Kershisnik later moved to painting. He now produces spiritually sensitive figurative images that somehow capture the freshness and simplicity of the American West. His religious art is very often in conversation with the canons of the Western tradition. Nevertheless, he infuses a certain ordinariness into scenes from the Bible. If Barsch presents a spiritual vision drawn from Mormonism’s Masonic and Orientalist past, then Kershisnik returns to its Low-Church Protestant roots. Even his crowds of angels look just like us. Those angels, by the way, are profoundly interested in human life. Even fairly quotidien scenes betray an unseen presence. Many of his characters are, quite literally, rough around the edges. In them, we can detect the faintest hint of Chagall. Particularly as so many of Kershisnik’s non-Biblical subjects seem to inhabit a stylized world hovering on the edge of allegory. Kershisnik is fundamentally an artist of human dignity, and the quiet joy that springs from that dignity. He also brings an understated sense of humor to much of his material, as in Jesus and the Angry Babies. Note in A Quiet Shining Dance of Sisters how Kershisnik draws together line (the mirroring of the two profiles) and color (gold) and texture (the mosaic effect in the upper half of the image) to suggest a spiritual union that goes beyond the merely physical elements of the titular dance. There are a few other Mormon artists worth knowing. Take, for instance, painter and illustrator Michal Luch Onyon, whose colorful and somewhat naive works are sure to delight. Or landscape artist Jeffrey R. Pugh, whose bold and strong brushstrokes evince the confidence of the West. He also created one of the more numinously beautiful depictions of Joseph Smith’s alleged vision, Early Spring, 1820. Finally, take a look at Nnadmi Okonkwo’s sculptures. The Nigerian’s graceful depictions of the human form are a testament to the respect afforded to women, and strike a beguiling balance between traditional African forms and American methods. His work is a testament not only to his considerable talent but to the great lengths which the Mormon church has traveled in its delayed acceptance of black members. The remarkable proliferation of Mormon fine art—not merely the kitschy stuff which characterizes so much religiously inflected work today—is certainly a sign of the faith’s expansion and self-confidence. Catholics should watch the continuing development of a specifically Mormon aesthetic as the LDS presence in society continues to grow. I just stumbled across Pietro Antonio Novelli’s engravings on the Seven Sacraments, completed in 1779. They give a fascinating view of ecclesiastical life in the late 18th century – Novelli would have moved to Rome from Venice about this time, so it’s unclear which part of Italy these were drawn from. Either way, they’re worth a look through. All are taken from Wikimedia Commons. Baptism. Note the prominent Angel and Devil. Confirmation. Strong and sound emphasis placed upon the role of the Holy Ghost. The Eucharist. The arrangement of the Altar and rail suggests that this is a low mass. Very odd that the Priest has no chasuble, but surplice and stole. Penance. Once again, we see the Angel-Devil dichotomy. Lovely open confessional, too. Holy Orders. It is entirely unclear to me where the Altar is supposed to be in this image. Nevertheless, the Bishop is wearing a wig, which answers a question of Fr. Hunwicke’s. Holy Matrimony. A fairly straightforward scene with lovely, somewhat spare Neoclassical church architecture in the background. Unction. The attendance of two servers is a custom long since out of fashion. One rather wonders when their presence was removed from the rubrics. What an extraordinary claim. The monks of Solesmes, Dom Prosper Gueranger’s own sons, publishing studies of Gnostic chants! Dear readers, do any of you have any information on this bizarre note? I have been able to find evidence, however scanty, that the book Anson mentions was indeed published. But it surely must count as one of the rarest volumes in the assembled miscellanea of liturgical history. I would appreciate any leads whatsoever. Might some of my liturgically minded friends have any clue? Whatever comes of it, there is no doubt a very interesting story lurking behind this utterly unique publication. There’s much in the calendar this month that makes one think of the Kings over the Water. On January 30th, we remember the death (cough cough *martyrdom* cough cough) of Charles I. James II was made Duke of York in January. 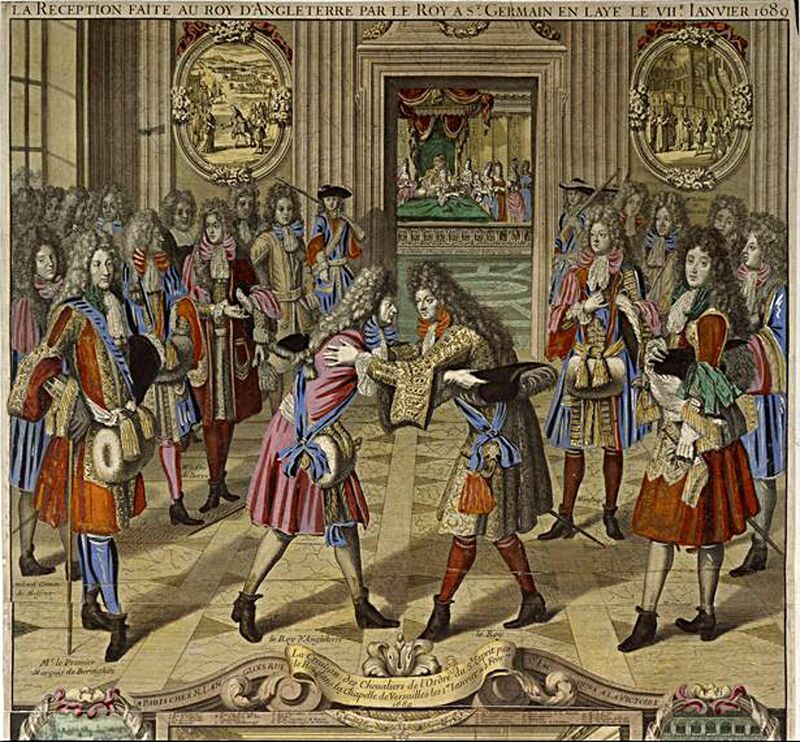 On the 7th of January, 1689, Louis XIV received James in exile at St. Germain-en-Laye. His son, the Old Pretender, died on January 1st, 1766. The very next day is the anniversary of the death of the Young Pretender, and thus of the accession to the Pretendence by his brother, Henry Benedict Stuart, Cardinal Duke of York, Cardinal Priest of Santa Maria in Portico, Cardinal Priest of Santi XII Apostoli, Cardinal Priest of Santa Maria in Trastevere, Cardinal Bishop of Frascati, Comendatario of San Lorenzo in Damaso, Dean of the College of Cardinals, and nominally Cardinal Bishop of Ostia e Velletri. There is a delightful passage about that event by Brian Fothergill in his book, The Cardinal King. It comes to me by way of Mr. Connor McNeill. You can find him at Mary’s Dowry. So it was decided that the funeral should take place at Frascati, for in his own Cathedral the Cardinal might do as he pleased. While Prince Charles lay in state dressed in royal robes with crown and sceptre, the stars of the Garter and Thistle on his breast, six altars were created in the antechamber at which more than two hundred masses were offered for the repose of his soul by the Irish Franciscans and Dominicans who attended him in the hour of death. The body was then placed in a coffin of cypress wood and taken to Frascati where the funeral took place on the 3rd of February. The little cathedral was thronged with people, among whom were to be seen many English residents and visitors from Rome, all in the deepest mourning. A guard of honour was formed from the Frascati militia and the chief magistrates if the town were all present. The whole interior of the building was hung with black and adorned with texts chosen by the Cardinal himself, the most appropriate of which was taken from Ecclesiasticus: ‘Ad insulas longe divulgatum est nomen tuum, et dilectus es in pace tua,’ – ‘Thy name went abroad to the islands far off, and thou was beloved in thy peace.’ The coffin was placed on a catafalque raised three steps from the floor of the nave and covered in a magnificent pall emblazoned with the arms of Great Britain; round about it burned many wax tapers while three gentlemen of the household clad in mourning cloaks stood on each side. As ten o’clock struck the royal Cardinal entered the church, being carried to the door in a sedan chair heavily festooned with black crêpe. He then advanced to his throne and began to chant the office for the dead while at other altars four masses were said by the chief dignitaries of the cathedral. As the Cardinal repeated the solemn words tears were seen to run down his cheeks and more than once his voice faltered as though he were unable to proceed. Fothergill goes on to describe the Cardinal’s performance of certain archaic royal duties. His assumption of royal rank had brought few if any changes to his mode of life beyond those minor adjustments in arms and title to which we have already referred. He would sometimes, as successor to King Edward the Confessor, touch for the King’s Evil, using a silver-gilt touch-piece engraved with a ship in full sail on one side and an angel on the other. The mystical aspect of royalty to which phlegmatic Hanoverians have never laid claim was probably, with the single exception of Charles X of France, practiced for the last time in human history by Henry IX. Your humble correspondent will have more to say as the Memorial of Charles approaches. In the meantime, you can celebrate this auspicious month by listening to an excellent little album of music composed for the court of the the Cardinal King. It is, I believe, the first recording of this recently discovered collection.